Which 'Books Don't Have Backup Batteries? Apple has posted a Knowledge Base article describing which portable Macintosh computers do not contain a backup battery and what this means. Because there is no backup battery in the computers listed in the section above, additional care should be taken ensure the AC adapter is plugged in. When removing the main battery without the AC Adapter, the computer should be shut down since the contents of RAM are lost when no power is available. There is a small capacitor that maintains the system clock long enough to swap the main battery. The PRAM is not affected by the long term removal of the main system battery. JR Hill has announced Screen Protectors for the new 12" and 17" PowerBook G4s. Available in both full grain leather or durable vinyl, Screen Protectors protect the PowerBook G4's screen from the keyboard when closed. All Screen Protectors come with lifetime warranty and are available now. The PowerBook G4 Sleeve is a form fitted, padded, full grain leather sleeve made for people who don't want a full sized notebook computer bag. The Sleeve can either be carried by itself or be placed into a briefcase or backpack. The Sleeve also features a zipper on all three sides, leather piping, and handles, along with a lifetime warranty. T3Hub is the first USB hub to pick up the design of the new generation of portables from Apple. Typically T3Hub will be used when the internal USB connections of the computer no longer satisfy the needs of a growing array of USB peripherals. T3Hub is available in the colors Ice (iBook 2001), Titanium (G4 PowerBook), and also in the classical translucent Graphite. T3Hub is equally useful when it comes to quick expansion of the number of USB ports on a desktop computer. In either setup, T3Hub will expand a single USB port on the computer into three USB ports. T3Hub plugs directly into the USB connector on the computer. An optional USB extension pigtail is provided to reduce strain on the built-in port. Like all mobile USB hubs T3Hub cannot be connected to another non-powered hub such as the hub that is integrated into every USB keyboard for the Mac. As a result T3Hub is always connected directly to one of the computer's built-in USB ports. T3Hub can be installed without turning your computer off. T3Hub is compatible with all USB devices. T3Hub is platform-independent, Mac OS (both 9 and X flavors), Win98/ME, Win2k, and Linux are fully supported. T3Hub Silver matches the white iBooks. T3Hub Graphite is an astounding addition beside just about any computer! includes a separate USB extension cable to reduce strain on built-in USB ports. 12 and 1.5 Mbps transfer rate available on all 3 connectors. 3 USB Type A Ports for USB-devices, active devices indicated via LED. Want to power several different notebooks without buying separate adapters for each one? Targus has an answer. Ultra-thin, ultra-light and ultra-portable, the Targus Universal AC Adapter is the perfect choice when you need a convenient power source that won't weigh you down - or when you're replacing a broken, lost or stolen original adapter. This universal adapter features patented PowerTips technology that automatically controls the voltage to match your notebook's requirements. Please confirm compatibility with your notebook model from the chart below before ordering. Click on the Related Products link at the right for a selection of PowerTips for wireless phones, PDA's and portable printers. Works with Apple iBook (presumably Clamshell only), PowerBook G3, PowerBook 3400, and a whole passel of PC laptops. 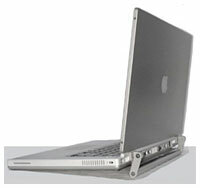 PowerBookMedic offers parts, installations, and repairs for G3 & G4 Apple laptops and iBooks, as well as for older models. Servicing all of the following PowerBook and iBook computer models: G4 Titanium, G3 Pismo, G3 Lombard, G3 Wallstreet, iBook (white), iBook Clamshell (pre-2001), and older models. PowerBook Medic offers a working on arrival guarantee on all parts and repairs, as well as a 48 hour satisfaction guarantee. Color powder coated to complement the PowerBook. 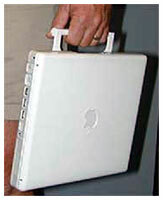 Tote your iBook by a handle. Tilt to allow air circulation under your iBook. Not a specifically portable computer item but cool, Celestia is a free real-time space simulation that lets you experience our universe in three dimensions. Unlike most planetarium software, Celestia doesn't confine you to the surface of the Earth. You can travel throughout the solar system, to any of over 100,000 stars, or even beyond the galaxy. All travel in Celestia is seamless; the exponential zoom feature lets you explore space across a huge range of scales, from galaxy clusters down to spacecraft only a few meters across. A "point-and-goto" interface makes it simple to navigate through the universe to the object you want to visit. Celestia 1.2.5 is now available for Mac OS X. In addition to supporting all of the new 1.2.5 features, the new build has a Cocoa interface. However, Celestia for Mac OS X should still be considered alpha software. The new release includes a lot of bug fixes and some major new features. In 1.2.5, comet tails are rendered, so you can see striking views of Hale-Bopp in 1997 and other famous comet encounters. The accuracy of Celestia has improved dramatically. It's possible now to watch the moons of Jupiter eclipse each other, follow the Voyager spacecraft on their grand tours of the solar system, and see the eclipse of Xerxes in 479 B.C.E. Models are specified with RAM/HD/media drive. RAM is in MB. Hard drive size is in GB unless noted as GB. RAM noted as 128+128 indicates additional RAM installed by dealer. The new 12" PowerBook is in stock at Power Max and come with a free copy of QuickBooks Pro for OS X.
iBook 600 12", 128/20/CD-ROM, $799. Receive a free Epson C42UX Printer (after dual rebates). refurbished iBook 800 12", 128/30/Combo, $1,188. eceive a free Epson C42UX Printer (after dual rebates). refurbished iBook 800 14", 256/30/Combo, refurbished, $1,399. Receive a free Epson C42UX Printer (after dual rebates).